Super-Natural Landscaping specializes in lawn care services for residential and commercial properties, but for our Do-It-Yourself Myrtle Beach landscaping specialists, there are a few things you should know and do to get your lawn mower ready for another summer mowing season. Obviously, it’s cheaper to do it yourself, but you also need to factor in the time it takes to do the work and obtain parts and supplies — and whether it’s something you actually want to do. To get your lawn mower read for summer, you’ll need a socket wrench, spark plug wrench, screwdriver, locking pliers, drain pan, work gloves, air filter, spark plug, motor oil and gasoline. Let’s get started! First, before you do anything with your mower, disconnect the spark plug. It’s a necessary safety feature because you’ll be touching the mower blade. When the spark plug is disconnected, the mower can’t accidentally start. 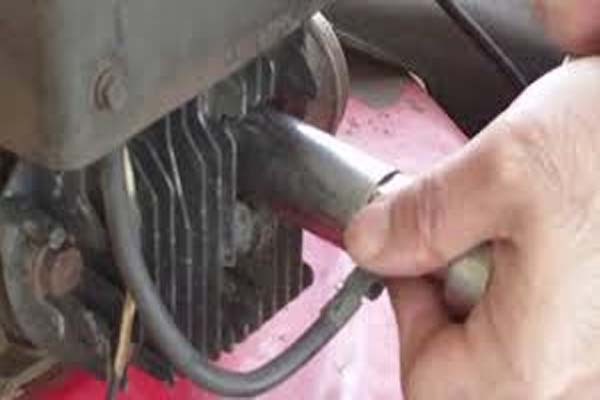 Simply locate the spark plug wire and use your hands to disconnect the rubber boot. Check your owner’s manual to see how to drain the oil from your lawn mower. If you don’t have the manual, search online using your mower’s make and model. Some mowers have a removable plug for draining oil, while others require you to tilt the mower on its side. Be sure not to pour the used oil into a garbage can or down the drain, or worse, into a ditch. Many auto service shops will dispose of used motor oil, but you might have to pay a small fee. Our local recycle centers will also accept your used motor oil. Air filters routinely get clogged with oil and debris, so replacing your filter before each mowing season will help protect the mower’s engine and ensure it runs optimally. All you need to do is remove the old filter and insert the new one. If it’s a paper filter, make sure the pleated side faces out. Reattach the air filter cover with your screwdriver and wipe it clean. Use a spark plug wrench to loosen the old spark plug before manually removing it. Make sure the new spark plug is the same as your old one, and has a gap, because if the arm touches the electrode, it will prevent a spark and your mower won’t start. Insert and tighten the new spark plug with your hands. Use the spark plug wrench to give it one more turn. Use caution as you tighten so you don’t damage the spark plug’s porcelain tip. You can sharpen the blade with a metal file or bench grinder, or have a pro do it at a lawn mower repair shop. Regardless of the method you choose, you’ll need to remove the blade. To address minor wear and tear, clamp the blade in a vice and run a metal file along the cutting edge. For more damaged blades, you’ll need to use a bench grinder. If you don’t have a bench grinder or you’re unsure how to use one, take the blade to a repair shop and let a pro sharpen it. Replacing an old blade with a new one is always an option, but will likely cost you a bit more. Before adding oil, make sure the drain plug is inserted. Many push lawn mowers use SAE 10W-30 oil. Use a funnel as you pour and check levels with your dipstick. If you had leftover gasoline sitting in your lawn mower over the winter, drain that old gas out and replace it with new, or you may have startup issues from the old gasoline. The final step in your DIY lawn mower tuneup is to reattach the spark plug wire. Do this only after you’re certain that the others tasks are complete and you’re ready to start the mower. If mowing your own lawn and taking care of your own lawn mower is not your idea of fun, let the professionals at Super-Natural Landscaping take care of all your lawn mowing needs this season. Give us a call at (843) 246-5598, or fill out our brief form and we’ll get back to you shortly. To get more Myrtle Beach landscaping tips, as well as tips for any of your landscaping projects, visit us on Facebook. Lawn Fertilization – When Should You Apply in Fall to Your Myrtle Beach Area Lawn? Lawn Fertilization - When Should You Apply in Fall to Your Myrtle Beach Area Lawn?